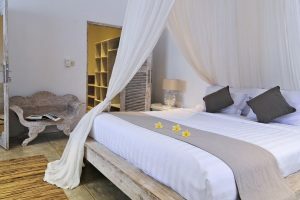 2 tasteful bedrooms with all the trimmings will host singles or couples looking for a classic holiday retreat. 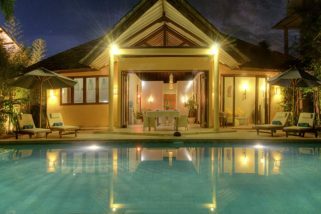 A long wooden building with high ceilings along with a decked pool, ensconced in tropical gardens, is the centre piece of the property. 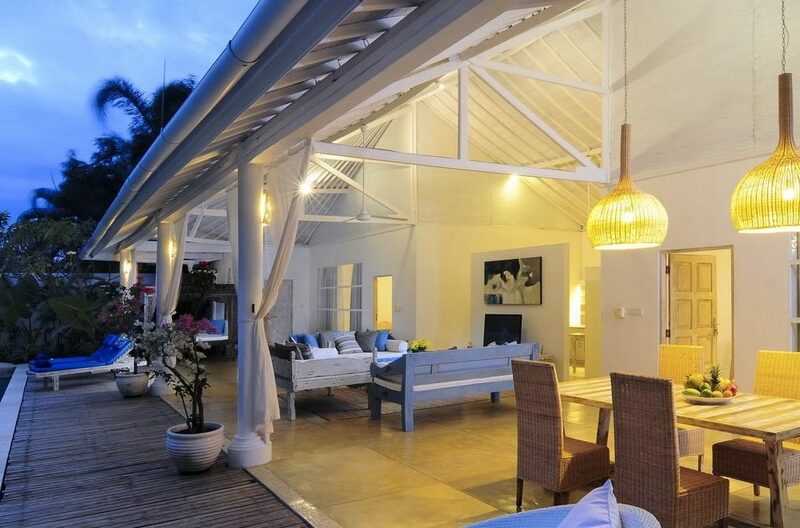 All modern amenities with island atmospherics will delight the senses as you settle into this cosy hideaway. 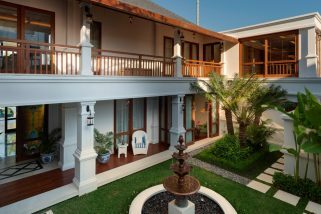 Only a fifteen-minute walk from beautiful Petitenget Beach, Villa Jolanda is in an ideal setting for a well-rounded Bali experience. 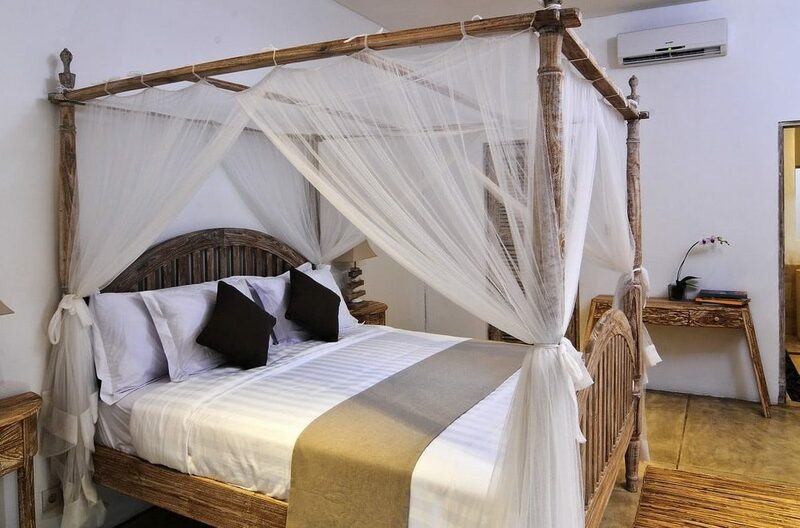 Everything you need and all the best attractions are conveniently located right nearby. 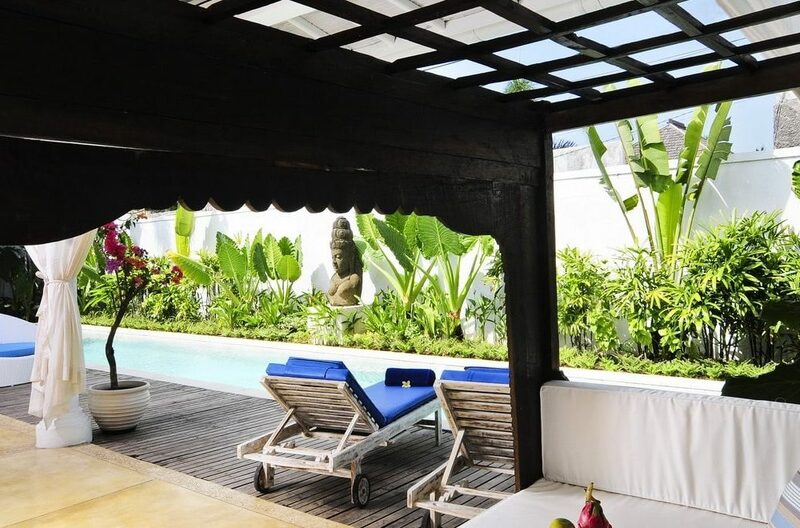 The villa staff is helpful, friendly, and ready to make this the best vacation of your life. Villa Jolanda is the fantasy island vacation you’ve been seeking. 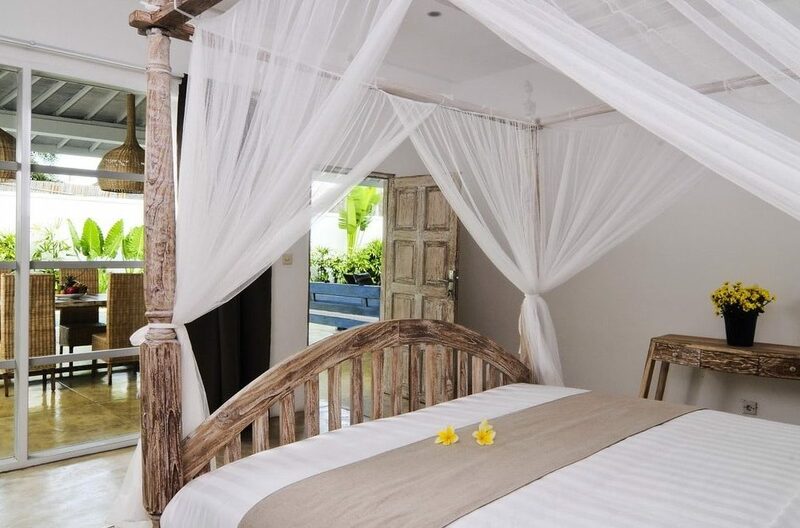 Villa Jolanda has two fully furnished bedrooms designed in a timeless style, with high roofs, antique wood furniture, and white walls that give the rooms a deeply serene and cosy ambience. 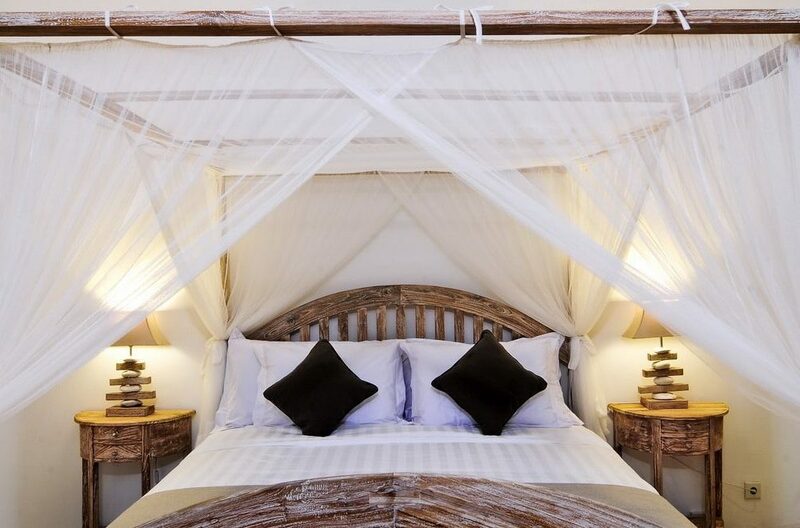 Each bedroom hosts a plush king sized bed on a wooden frame, complete with comfy bedding and surrounded with mosquito netting so your sleep will be deep and trouble free. Enjoy pool views through the large windows – and maybe take an energising morning swim too. 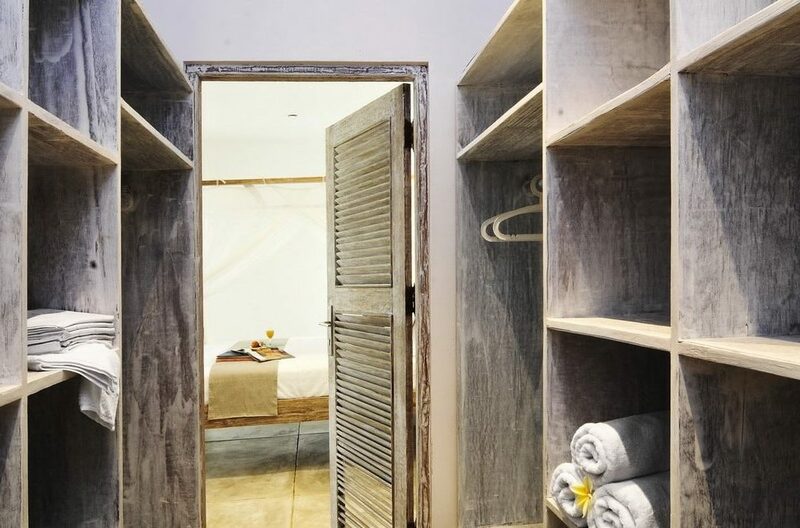 The bedrooms come with walk-in wardrobes with plenty of storage space to hold all your belongings and plenty more that you will buy later. Armchairs and end tables with lamps make stretching out to read a book tempting and easy. In-room safes keep your valuables secure. Open up the doors to take in the tropical breezes, or turn on the air conditioning and chill out all night long, the choice is yours. 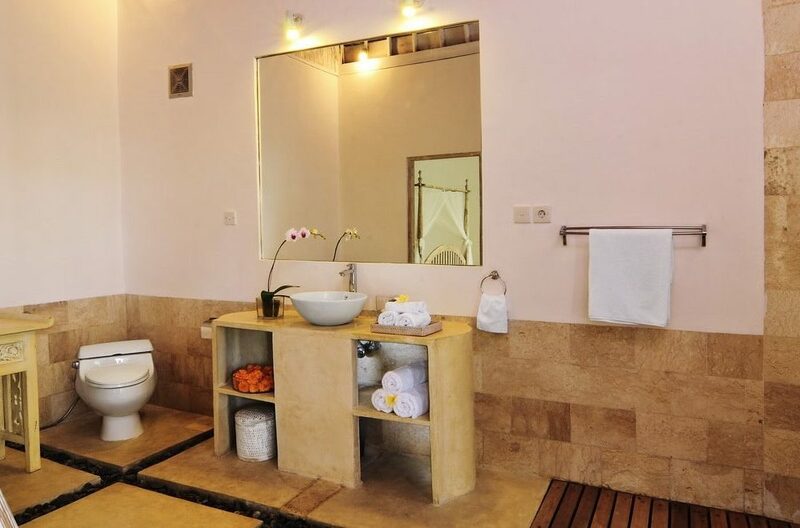 Big ensuite bathrooms with high ceilings and spacious shower areas are standard with both bedrooms. 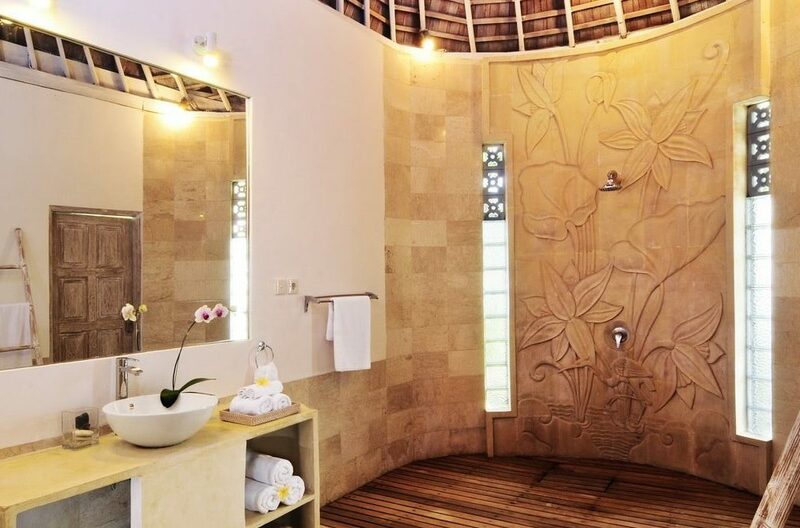 The rainfall shower stalls have a cabin-like wooden floor and open plan aesthetic that feels as clean as you’ll get. 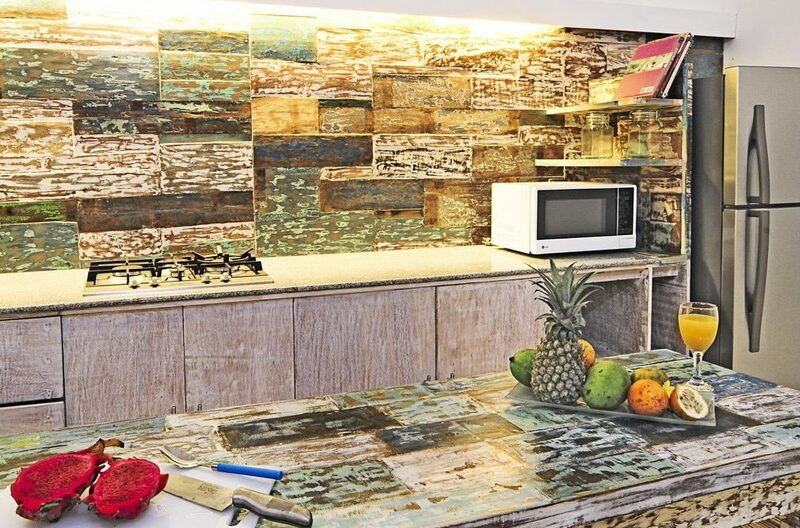 The decor lends the rooms a homey vibe. All the amenities needed are included, along with hair dryers, plenty of clean fluffy towels, and lots of storage nooks. 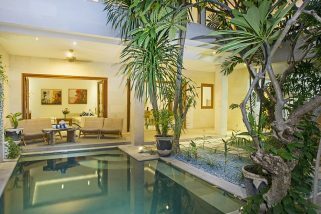 You’ll enjoy Balinese comfort in the large open plan living area that runs along the side of the swimming pool. Cooled by island breezes and fans in the high ceiling, it’s a pleasant, comfortable area that you’ll have a hard time leaving. Three cushioned sofas cluster around a large flat screen TV hooked up with satellite channels and a DVD player. Use the included high-speed wifi internet for your favourite streamed shows, or maybe upload some vacation photos while you kick back with your feet up. The furnishings all have a unique antique quality that fills the place with holiday character. 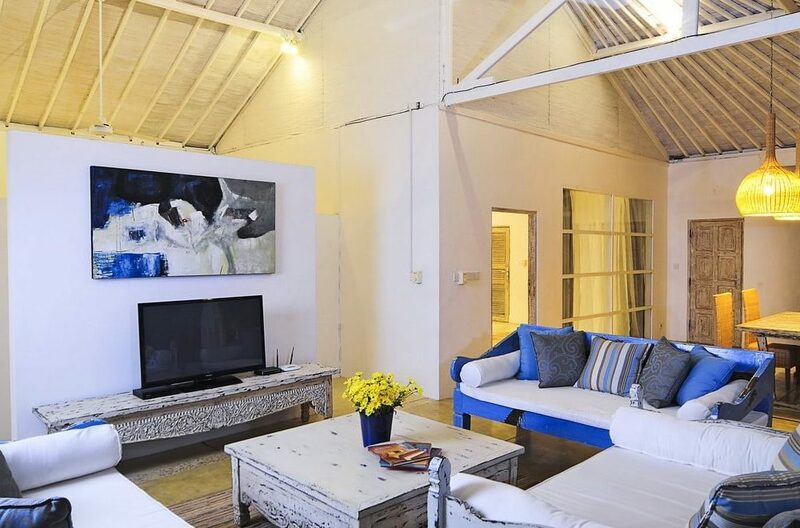 Pull up a wicker chair at the eight seater, wood dining table and enjoy some take out food from a local Indonesian restaurant. 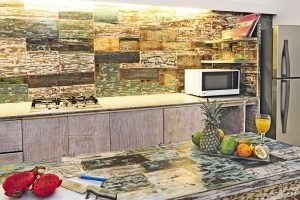 If you’d like to cook up a hearty breakfast or dinner with fresh local ingredients from a nearby market, there’s a fully equipped western kitchen with a microwave, gas range, and refrigerator ready for you to become the latest Iron Chef. The staff can arrange grocery delivery or even room service if you are so inclined. 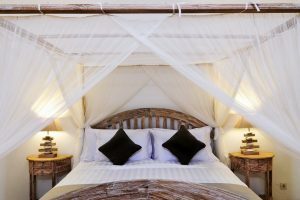 There are pool chairs for sunning and a cushiony love seat along the edge of the outdoor wooden deck, ready for you to lounge in all day long – just don’t forget your sunscreen. Spend some time perfecting your backstroke as you glide through the glistening twenty-meter pool waters like a fish. The surrounding private gardens offer beauty, tranquillity, and a great place to set down your yoga mat for asanas or meditation. Our staff is professionally trained, experienced, and incredibly friendly – everything you want and need in a hospitality team at a vacation villa. 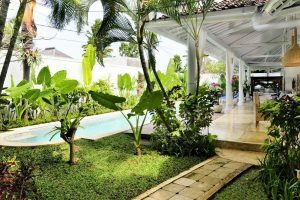 If you need to arrange anything from Balinese massages to car hire to babysitting, do not hesitate to ask the villa manager because everything is possible in Bali. 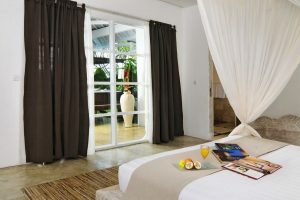 Daily housekeeping and gardening services are included, and arrangements can be made for laundry. We offer service with a smile at Villa Jolanda. 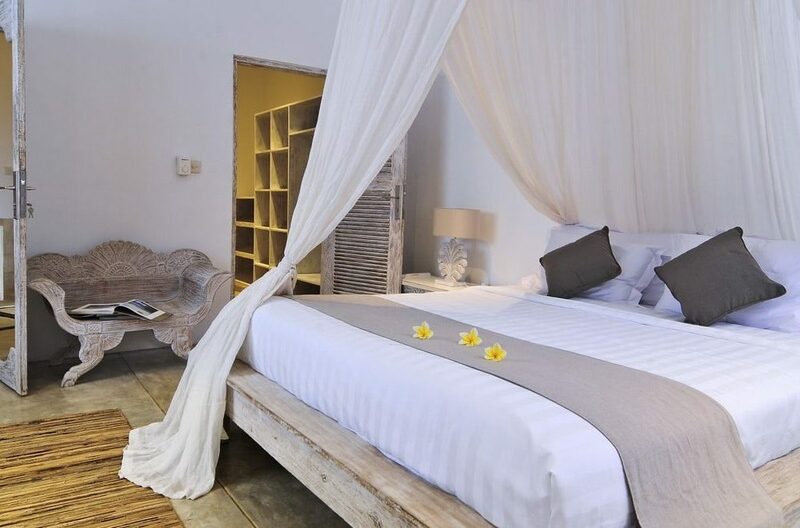 Enjoy some of the best beaches in Bali just a short distance from your front door. Petitenget Beach is closest and offers a secluded ambience, sparkling sands, and spectacular sunsets that must be seen to be believed. Long beach walks, ocean dips, or just lazing the day away in a beach chair as the sun passes overhead are all excellent choices. 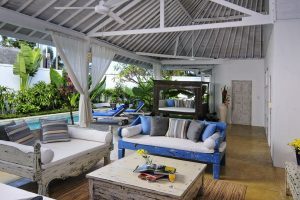 The legendary Ku De Ta Beach Club is less than a kilometre away if you’d like to enjoy nightlife by the ocean side. An incredible selection of restaurants, shopping, and nightlife are all easily accessible from the villa by foot or convenient taxi. 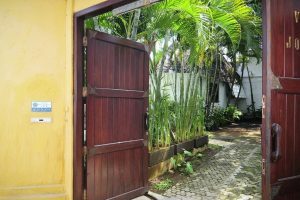 It’s a five-minute walk to the Seminyak Square Shopping Center where you’ll find all the items you didn’t know you needed or wanted to buy. The famous Eat Street with its plethora of mealtime choices will keep your palate fascinated and your belly full at breakfast, lunch, and dinner time. 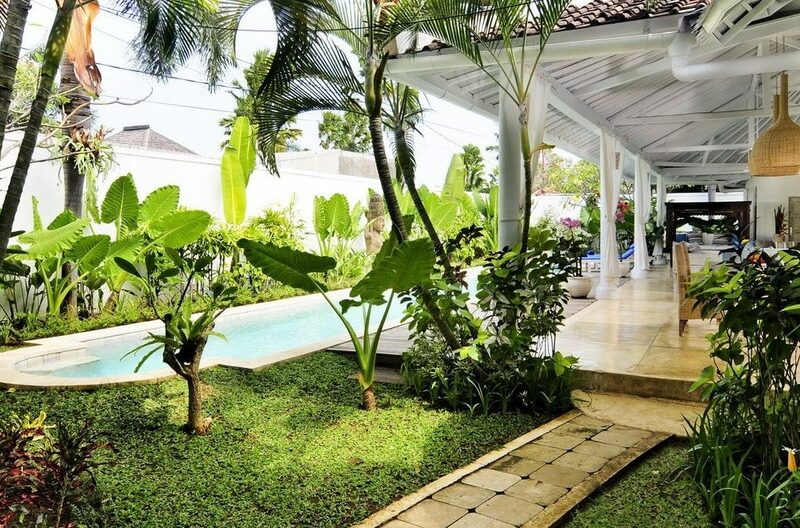 With quiet classic comfort and luxury combined with a fantastic location, it’s hard to beat Villa Jolanda as a prime place for an amazing Bali vacation. 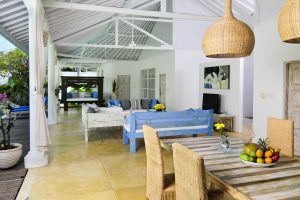 Villa Laella is a quaint two bedroom hideaway offering fine intricate furnishings creating a truly nostalgic theme in paradise. 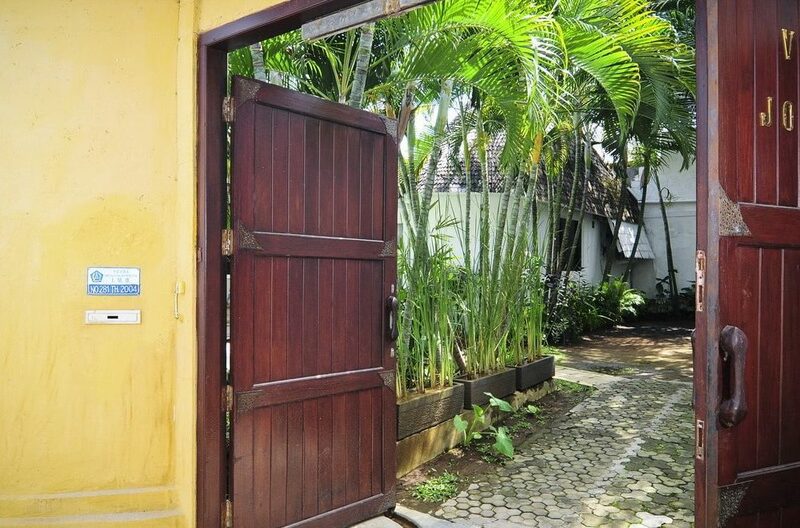 This lovely 3 bedroom villa offers those on a budget a great opportunity to stay in the lap of luxury right in the centre of Seminyak.